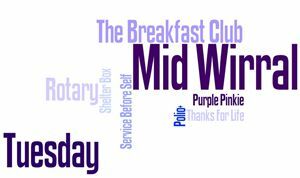 Rotary Club of Mid Wirral - Welcome! We are a breakfast club meeting on a tuesday morning at the Glegg Arms in Heswall. The club has about 30 members, men and women working and retired. We usually enjoy a speaker at three out of four of our morning meetings and do Council feedback and business on the fourth. Fifth tuesdays and those immediately following a bank holiday are often evening meetings, walks in the summer and something else in the winter.